Adventure can take you anywhere you want to go. Driving around just to see what you may discover is always amazing. Since moving to Tennessee I have been exploring every chance I get. When a road looks interesting I turn on it to see what I can find. Sometimes you get lucky, sometimes you don’t. While out and about one day recently, I followed my instincts to hopefully come across a photographic scene. I’m always curious if I can locate a great landscape or a hidden gem off the beaten path. 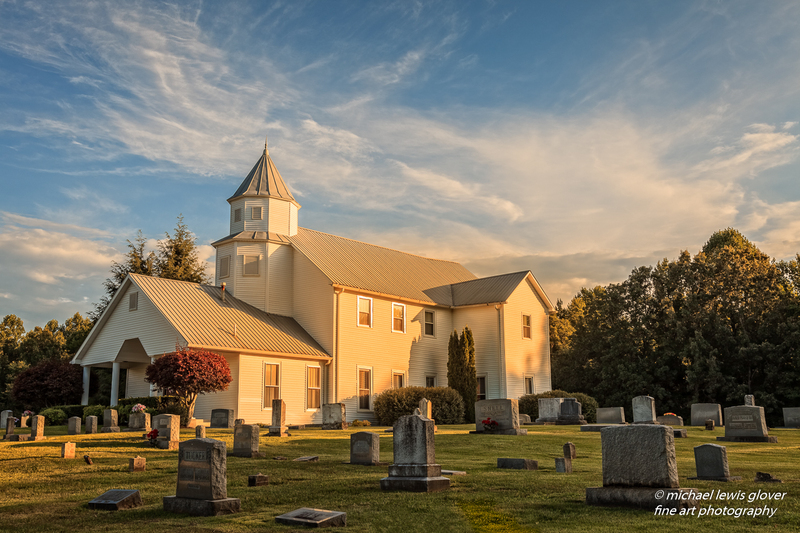 Well as luck would have it, at the end of this road was this beautiful church. The sun was low in the sky and the light was just perfect. I knew I needed to get my camera gear out and take some pictures. The angle was just right for the time of day. 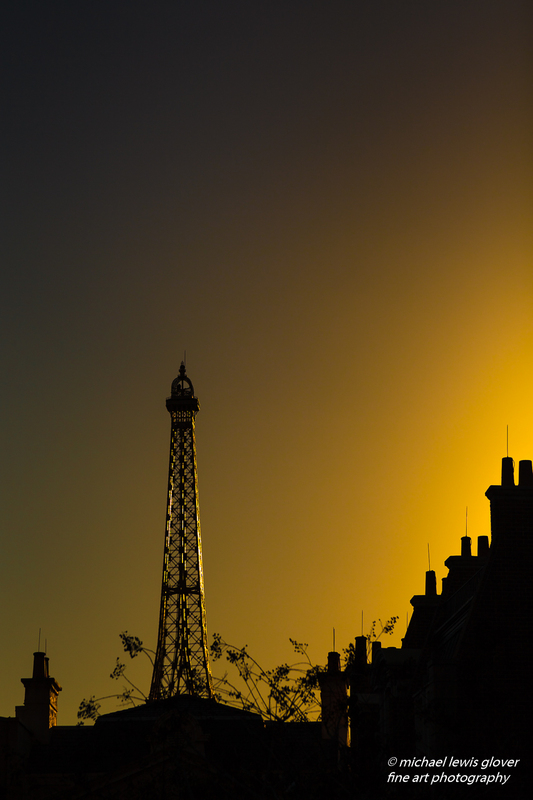 The golden glow was so awesome that I stopped shooting to just look at this fantastic scene in front of me. This is the kind of stuff I hope for. If you’re not already following my blog please click on the “Sign me up!” button to be notified of new blog posts as soon as they are available. I hope you enjoyed today’s post. Please consider leaving a comment as I always enjoy hearing from my visitors! Please click on the image below to view full-screen. Just outside of Nashville, Tennessee is the beautiful city of Franklin. One end of the Natchez Trace Parkway is located here. The parkway covers 444 miles through Tennessee, Alabama, and Mississippi with a very scenic drive. One of the sights not to be missed is the 145′ tall bridge. Opened in 1994 it spans 1,572′ as it crosses over a highway connecting tree-lined roadways. Once I settled on a view that I liked I setup my tripod to take some photos. With such a wide scene a standard lens was not doing the job of capturing the entire bridge in one shot. I decided to try out my 8mm fisheye lens. This was going to do the trick! The bridge itself is pretty much straight across, however the fisheye lens added in some distortion which bowed it out slightly. I thought it looked cool so I kept shooting from different perspectives until I found what I liked. This image was shot in February on a very gray cloudy day. There wasn’t a lot going on color wise, so I went for black and white to bring out the textures. 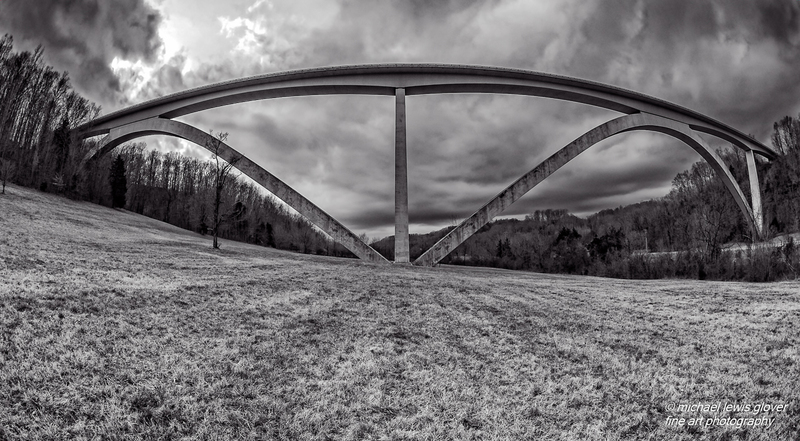 A low angle view of the double arch bridge in Franklin, Tennessee. Hi everyone! First off I’ll start by saying sorry for the long hiatus. I promise to try and post more this year. Right before Christmas I moved to Tennessee and things have been hectic as you can imagine. But I am finally getting into my groove so to speak. I am now living just outside of Nashville so you will be seeing more Tennessee pictures with some Florida stuff thrown in once in awhile! For my first post of 2016 I present to you an historic house that I recently photographed. 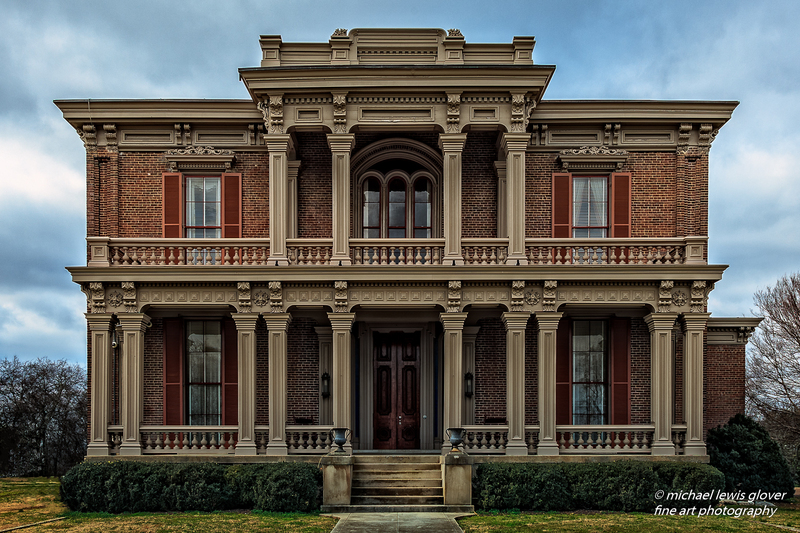 Two Rivers Mansion in Nashville, Tennessee is a beautiful example of fine quality architecture. Built in 1859 it has stood the test of time. The attention to detail is really quite remarkable. This is one of the reasons I love photographing old buildings; the workmanship is always really impressive considering the limited amount of tools to work with for the time period. For now I will leave you with this image but will be posting lots more really soon as I have been doing lots of exploration and traveling in my new home state. Two Rivers Mansion in Nashville, Tennessee. Back in September I participated in the 500px.com Global Photowalk. It was a day to get out and take pictures with other photographers and have a chance to socialize. The leader of the Tampa, Florida photowalk (which actually took place at Honeymoon Island in Dunedin) was Matt Kloskowski. He did a great job of making sure everyone had fun and got to take lots of photos. Unfortunately the weather decided to be somewhat uncooperative at the start of the walk. We had a fantastic lightning show while we all stood under a building at the beach. The rain kind of went around us and we even got to see a couple of rainbows. Once he deemed it was safe for us to venture out onto the beach, we all went to work. I have to say, if you want dramatic lighting, just after a storm passes is definitely the time to be out shooting! This scene in particular caught my eye and I had to stand there a few minutes just to visually take it in. The textures of the clouds, the glow of the setting sun behind this massive storm front, and the water pouring out of the sky put my senses into overload. I used the the wooden pilings to add some interest to the bottom left of the frame and create balance in the image. A vertical shot was the only way to go to fit all of this in the frame. On second thought, maybe the weather wasn’t so unfortunate after all! Taken on Honeymoon Island in Dunedin, Florida. 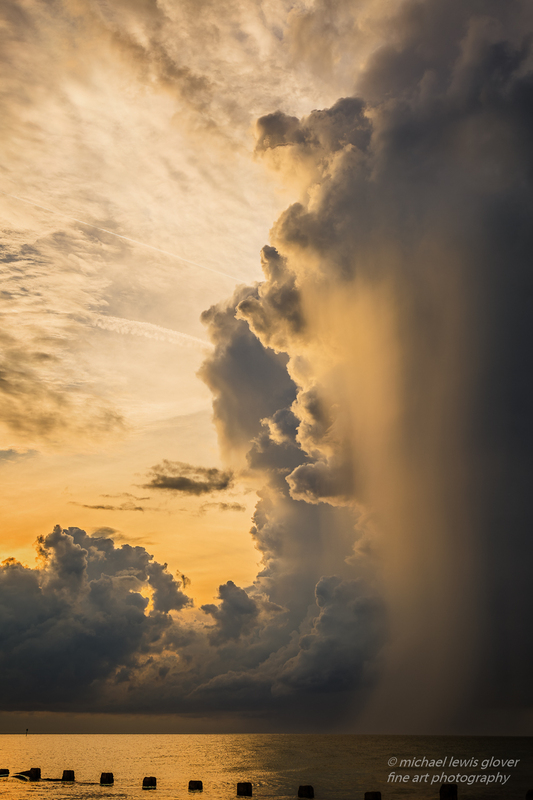 A massive storm cloud passing through close to sunset drops a beautiful glowing rain shower. Since Halloween will be here soon, I wanted to create a photo composite with some spookiness. The main character in this image is named Dwiegord. ​He is a character who is part tree and part man. Occasionally I pass by this old abandoned building in my travels. 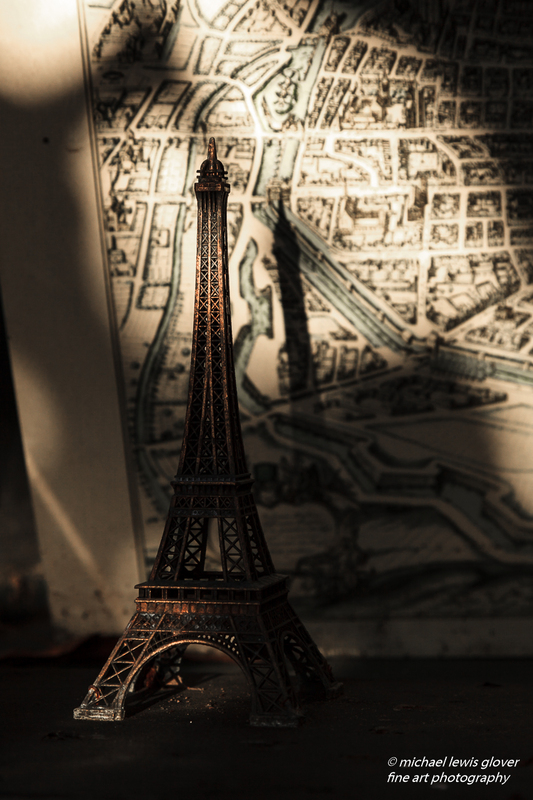 Whenever I see it I always think it would be cool for a picture. I recently saw it and decided to stop to get a photo. Since I shot it in the middle of the afternoon, a little bit of transformation was needed to make it look like a nighttime image. 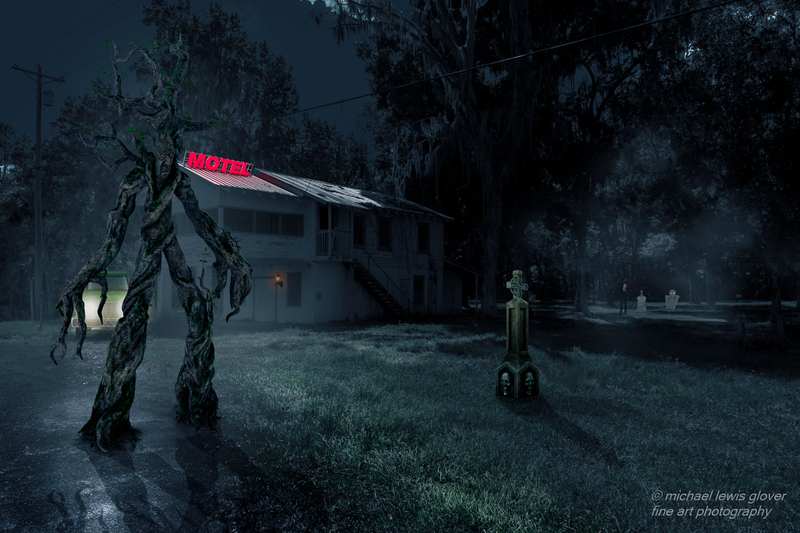 After that, I added in the 3 gravestones, the man in the background, the motel sign, the truck, the light by the door, and the tree-man. I painted in all of the lighting, shadows, and fog to complete the look and feel. When I shot the original photo, my imagination was taking me to a spooky, foggy, moonlit night. I knew the placement of the building and trees was critical to my final vision. I had to be sure to leave room to add in the accompanying elements to make it all come together. ​Dwiegord is a character who is part tree and part man. Fantasy composite from an original photo of an old building with the elements added in. From my camping trip last October(2014), I would like to share another photo. This was taken in Asheville, North Carolina during Scott Kelby’s Worldwide Photowalk. What struck me most about this building is the fact that the shape resembles a judge’s chair. I’m not sure if it’s a coincidence or by design but the significance made me want to get a picture. A cooperative sky brought out some beautiful cloud formations, while the setting sun at my back provided warm light. The color version of this photo was good but it didn’t quite convey the impact I wanted. I decided to convert the image to black and white and that really brought out the textures. Please stay tuned as there are more pictures to come! 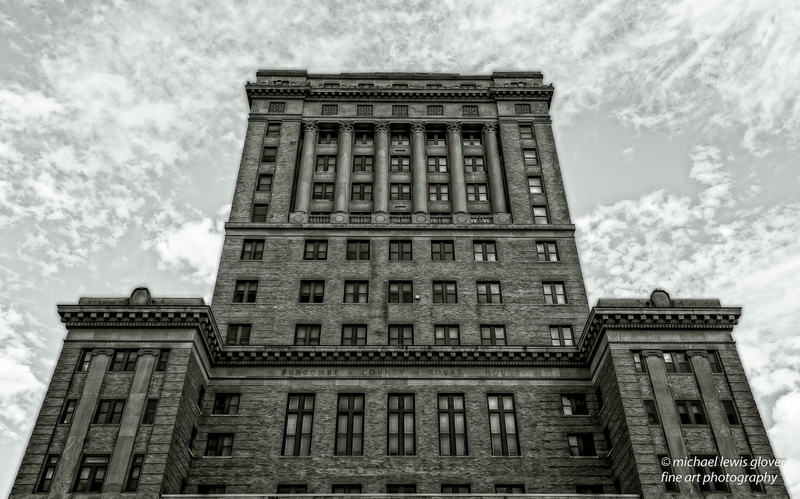 The courthouse building located in Asheville, North Carolina.